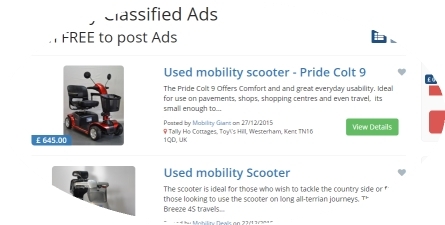 Our used mobility classified ads section can be used by businesses and the general public alike. After years of experience in the new products sector, many of our members were regularly being asked if they bought used mobility equipment. This prompted us to create a part of our site to allow members to buy and sell used mobility and disability equipment in a fast and affordable way. Many buyers of mobility aids may only need a temporary solution. Maybe a friend or relative is recovering from a fall or an operation that affects their day to day comfort or mobility. In this instance if there is no option to hire the needed product, second hand products offer a more cost effective solution and when the 'patient' no longer has a requirement for the aid, it can be readvertised on My Mobility Hub. It is really easy to sell your used mobility or disability equipment, simply create an account (if you don't already have one) and navigate to Classifieds in your members dashboard, you'll find this on the left hand side menu. 2. You will see Publish? Yes/No - Don't forget to click YES or Ad will not show live on site. The following screen will allow you to upload images. Add your images and your ad is now complete.